Statues commemorate women's rights activists at the Women's Rights National Park. An avant-garde religious climate helped WNY women cut their teeth on social causes like temperance and abolition, then move on to their cause célèbre-the women's rights movement. In a locale as improbable as a Hollywood movie set, the main scenes of this drama were played out in Seneca Falls, a small Erie Canal port and textile mill town in predominantly agricultural Seneca County. A century later this prototypical small town was thought to be the model for Bedford Falls in the Frank Capra classic, "It's a Wonderful Life." It was here that Elizabeth Cady Stanton, a curious blend of housewife and radical thinker, spearheaded plans for the 1st Woman's Rights Convention in 1848. "The trouble was not in what I said, but that I said it too soon, and before the people were ready to hear it," she later commented. 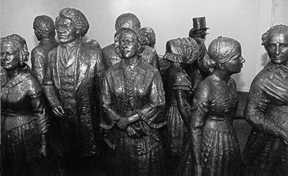 Two of her closest allies in the battle were Rochesterians Susan B. Anthony and Fredrick Douglass, an abolitionist leader and former slave. Anthony later went to jail for illegally attempting to vote. It took over 70 years until women's suffrage finally became the law of the land with the adoption of the 19th amendment in 1920. Another famous Genesee Country woman, Civil War nurse Clara Barton, founded the American Red Cross. Western New York had always been a mecca for escaped slaves, due to its proximity to Canada. After passage of the Fugutive Slave Law in 1850, runaway slaves booked passage on the Underground Railroad, which had three main routes running through Western New York. Along the way fugitive slaves were assisted by local abolitionists, who hid them, fed them and transported them through the region and on to freedom in Canada, despite the threat of fines and imprisonment. Main Street Reynolds Arcade, Rochester. Once the hub of abolitionist activity. Talman Building, Rochester. Site of Frederick Douglass's newspaper office, where slaves would seek his assistance. Pliny Sexton House and the Western Presbyterian Church, Palmyra, Wayne County.